Today's result, which reveals new characteristics of HR8799e, required an instrument with very high resolution and sensitivity. GRAVITY can use ESO's VLT's four unit telescopes to work together to mimic a single larger telescope using a technique known as interferometry. This creates a super-telescope—the VLTI—that collects and precisely disentangles the light from HR8799e's atmosphere and the light from its parent star. HR8799e is a 'super-Jupiter', a world unlike any found in our Solar System, that is both more massive and much younger than any planet orbiting the Sun. At only 30 million years old, this baby exoplanet is young enough to give scientists a window onto the formation of planets and planetary systems. 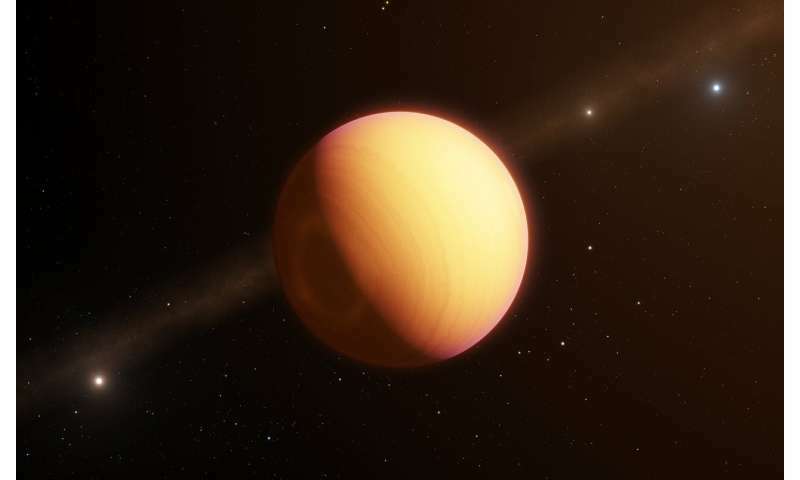 The exoplanet is thoroughly inhospitable—leftover energy from its formation and a powerful greenhouse effect heat HR8799e to a hostile temperature of roughly 1000 °C. This is the first time that optical interferometry has been used to reveal details of an exoplanet, and the new technique furnished an exquisitely detailed spectrum of unprecedented quality—ten times more detailed than earlier observations. The team's measurements were able to reveal the composition of HR8799e's atmosphere—which contained some surprises. "Our analysis showed that HR8799e has an atmosphere containing far more carbon monoxide than methane—something not expected from equilibrium chemistry," explains team leader Sylvestre Lacour researcher CNRS at the Observatoire de Paris—PSL and the Max Planck Institute for Extraterrestrial Physics. "We can best explain this surprising result with high vertical winds within the atmosphere preventing the carbon monoxide from reacting with hydrogen to form methane." This result builds on GRAVITY's string of impressive discoveries, which have included breakthroughs such as last year's observation of gas swirling at 30% of the speed of light just outside the event horizon of the massive Black Hole in the Galactic Centre. It also adds a new way of observing exoplanets to the already extensive arsenal of methods available to ESO's telescopes and instruments—paving the way to many more impressive discoveries. Wow! That's an amazing amount of detailed information from an exoplanet. Never thought this was possible. GRAVITY is an impressive instrument. We'll get a lot of data and papers from it, and its follow-ons will get even more. It may even edge out ALMA, which is saying a lot. "Our analysis showed that HR8799e has an atmosphere containing far more carbon monoxide.... "We can best explain this surprising result with high vertical winds within the atmosphere preventing the carbon monoxide from reacting with hydrogen...".....The team found that the atmosphere also contains clouds of iron and silicate dust. When combined with the excess of carbon monoxide, this suggests that HR8799e's atmosphere is engaged in an enormous and violent storm. I wonder if excess Carbon Monoxide reacts with that Iron to create Iron Carbonyl? And if that Silicon reacts with any excess Chlorine to produce Silicon Chloride? Both are volatile, more easily entrained in storm currents bringing the Iron/Silicon into upper atmosphere for easier detection? Would these two compounds create complex 'constant-interchange' chemistry while mixing aloft? An excellent find by newly developing technology..
My only disappointment was how young the planet & it's star system are. Still this raises hopes that we are reasonably closer to the tech needed to detect planets billions of years older. It would not be unreasonable to speculate if similar duper-gas-giants are able to maintain that degree of internal heating? That there is an implausible but not entirely impossible opportunity for a habitable moon with an iron-core, surviving long enough to evolve an Alien Biosphere? It is also possuble that there maybe dwarf-rocky worlds still assembling out of the planetismal-debris-disks? I find this very unfortunate that this astounding news was decided to be accompanied by an artist impression image and that this very fact is (was the time I read) not mentioned anywhere in the article. I think anybody of even moderate intelligence would realise that that is an artist's impression! 129 light years! You think we could get an image like that?